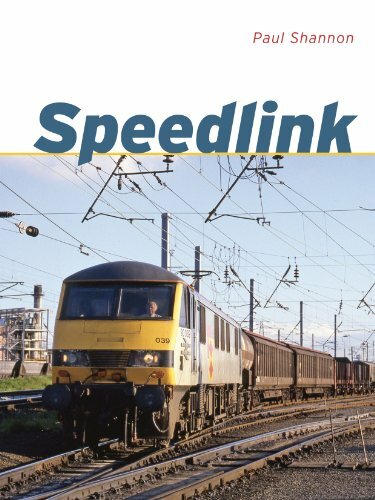 Speedlink by freight traffic expert Paul Shannon is a pictorial history of the background to the service, its development and operation before 1991, and an overview of the survival of wagon-load freight since Speedlink ceased operation. Gloriously illustrated throughout by photographs of services in a variety of guises across the network. While the Reshaping Report of 1963 had envisaged British Rail’s effective withdrawal from the wagon-load freight business in favour of a concentration upon the block train – such as the coal traffic from colliery to power station – the railways always believed that there remained some traffic that it could carry profitably through a limited number of trains serving a limited number of destinations using air-braked wagons. The air-braked network with dedicated wagons was established in 1974 and from this grew the Speedlink network, which, after some investment, was formally unveiled in 1977. For the next decade, courtesy of Section 8 grants, considerable investment in new terminals and equipment was undertaken. The core network was based upon 12 main marshalling yards with some 200 subsidiary yards as well as countless private sidings, with services extending over much of the BR network from Inverness to Milford Haven and Cornwall. The future of the company was always under question throughout the 1980s due to continuing losses. One reason for keeping the service was a potential increase in traffic after the opening of the Channel Tunnel. Despite this though, by 1991 the losses were considered unsustainable and the Speedlink service was closed down, as part of an attempt to convert BR into a commercially viable business prior to privatisation.Thus, effectively, the widespread movement of wagon-load traffic on Britain’s railways ceased although both pre- and post-Privatisation freight operators have tried to restore some traffic of this nature. Paul Shannon has been a keen follower of the railfreight scene since the 1970s, and has written and illustrated a large number of books, magazine articles and video/DVD scripts on various aspects of the topic. His writing is based on a combination of interviews with railway managers and visits to railfreight locations throughout the country. Paul has also co-written a number of text books and produced online materials for the teaching of German and French.